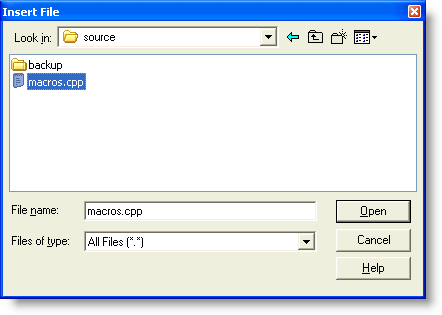 The File Insert command is used to insert (some may say 'import') the content of another file at the current location of the text cursor. The standard Windows Open File dialog is presented for selecting a file and, after its selection, the content of the file will be placed at the cursor. Any text file can be selected for insertion (subject to Sizes and Limits), even one which is being edited in another editor window. See the Open command for full details on using the standard Window Open File dialog.